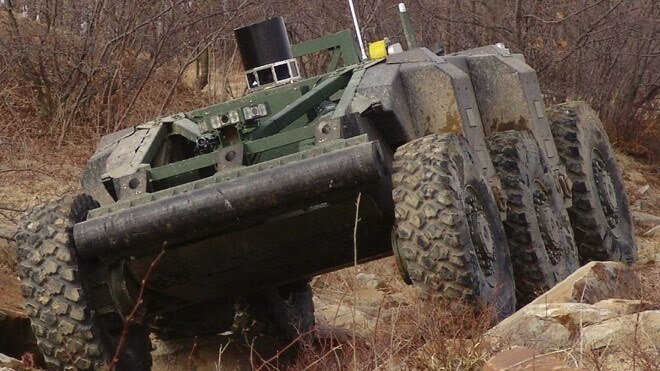 Case Study: Crusher | KLH Industries Inc.
KLH Industries, Inc. recently contributed precision-machined aluminum to the "Crusher," an unmanned ground combat vehicle funded by the Defense Advanced Research Projects Agency (DARPA) and the U.S. Army. As an ITAR registered job shop, KLH is no stranger to military or defense machining. Crusher is a six-wheeled, all-wheel drive, hybrid electric, skid-steered, fully autonomous ground vehicle that can carry up to 8,000 pounds of payload without compromising mobility. To watch the 6.5-ton vehicle effortlessly climb steps in excess of 4 feet, click here for a Crusher highlight video. According to a Carnegie Mellon news release, "electric motors embedded in each of the vehicle's six wheels are powered with a hybrid system that uses a turbo diesel generator to recharge its batteries." It is estimated that the technologies developed for Crusher could also have commercial use in the areas of construction, farming, and mining. For more information, view the National Robotics Engineering Center.